Just as with Skype and many other tools that use VoIP technology for communication, Google has its tool for making voice and video calls. It is Hangouts, which replaced Google Talk and is now the Google communication tool. You can use it embedded in your browser while logged in to your Gmail or Google account or any other Google account, or you can use it directly in Hangouts. From Hangouts, you can connect with up to nine other people at a time for a video call, which is perfect for contacting family groups, co-workers, and friends. You can contact any of your Gmail contacts, which are automatically imported to Google+ and Hangouts when you sign up. If you are an Android user and are logged in as a Google user on your mobile device, your phone contacts are saved and synced with your Google account. The first time you start a video call on your computer, you'll have to grant Hangouts the right to use your camera and microphone. 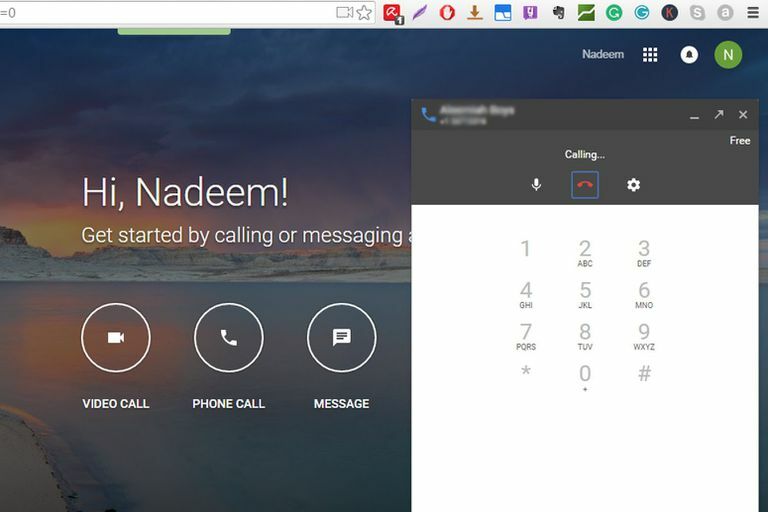 On any browser other than Chrome, you'll need to download and install the Hangouts plugin. A Google account. You already have one if you use Gmail. Good broadband connection. The ideal speed is between 3.2 and 4.0 Mbps (or faster) depending on the number of participants. Go to your Hangouts page or to the sidebar in Gmail. Click the name of a person in the contacts list. Click additional names to start a group video call. Click the video camera icon. Enjoy your video call. When you're finished, click the End call icon, which looks like a hung-up telephone receiver. In Hangouts or Gmail, text chatting is the default. Select the name of a person in the left panel to open a chat window, which works just like any other chat window. To place a voice call instead of a text, select a person's name in the contacts list in the left panel and click the upright phone receiver to start the call. If you are in your Google+ screen, Hangouts is located under the drop-down menu options at the top of the screen. You have the same calling options in the left panel of Hangouts as you have in Gmail: message, phone call, and video call. Hangouts voice and video calls are free, provided you are communicating with a person who is also using Google Hangouts. This way the call is fully internet-based. You can also call landline and mobile numbers and pay VoIP rates. For this, you use Google Voice. The rate per minute for the calls are much lower than for cellular or landline calls. For example, calls to the United States and Canada are free when they originate from the U.S. and Canada. From elsewhere, they are charged as little as 1 cent per minute. There are a handful of destinations that cost 1 cent per minute, others 2 cents, while others have higher rates. You can check the Google Voice rates here.